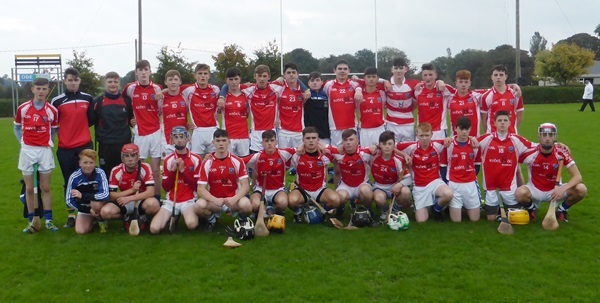 Thurles CBS qualified for the semi-final of the Dean Ryan Cup courtesy of a hard earned victory over Gaelcholaiste Mhuire AG in a game played in the little town of Emly. This game played in the midst of a steady breeze and constant drizzle may have been low in scoring but lacked nothing in terms of honest endeavour, hard tackling and a high work ethic. Thurles CBS played with the advantage of the breeze in the opening half and it took all of five minutes for their opening score, a point from play by Jack Lanigan. The AG took until the ninth minute to open their account courtesy of a free by Seán Ó Riagáin to bring the sides level. By the end of the first quarter, Thurles led by 0-3 to 0-2 but Gaelcholaiste Mhuire AG were more than holding their own, in particular in defence. The best goal chance of the opening half arrived in the 24th minute with the teams deadlocked by 0-4 apiece and resulted in Max Hackett’s effort being well saved by Daithi Ó Liathain in the AG goal. Approaching the interval, a Darren Flood free edged Thurles CBS in front and they led at the interval by 0-5 to 0-4. The statistic of 9 scores and 13 wides in the opening half (7 for Thurles CBS) illustrated the wayward shooting under pressure by both schools. The opening stages of the second half belong to Gaelcholaiste Mhuire AG as they began to take advantage of the wind as their backs. Three unanswered points in the opening ten minutes of the second half from Ross Standún, Evan Ó Murchú (free) and Daire Ó Conaire (a free from well inside his own half) helped the Cork side in to a 0-7 to 0-5 lead. Thurles were struggling to make inroads at this stage, in particular from placed balls but managed to get back in to the contest courtesy of two points from play in quick succession by Keith Ryan to bring the sides level heading in to the final quarter. Such was the competitive nature of this game, the first team to engineer a goal was always going to be favourite to take the spoils and so it proved. 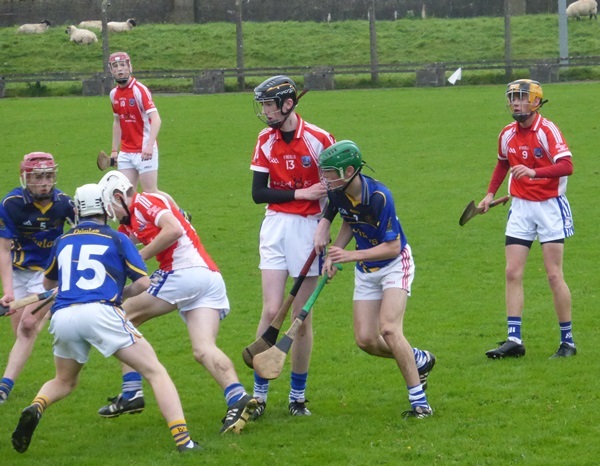 Despite the presence of a number of AG defenders, Thurles CBS managed to execute a couple of quick-fire handpasses which saw the ball end up in the hand of wing-forward Max Hackett. Though closely marked, Hackett managed to get in a low shot which found the back of the net to give Thurles a 1-7 to 0-7 lead after 47 minutes. Thurles CBS built on this crucial score with the next couple of points, both from play by Darragh Tynan and Darren Flood to cap off a 1-4 to 0-0 run in a ten minute period which would prove decisive. The AG were struggling to make any impression up front, in particular from open play as they hit 12 wides (6 in each half). The Cork school would only add a couple of Seán Ó Riagáin pointed frees to their tally in the closing stages. These points were cancelled out by two Darren Flood points for Thurles, the last one a free in injury time to wrap up a five point victory for the Tipperary side. Thurles CBS will now play Midleton CBS in the semi-final next Wednesday at 1:30pm in Ardfinnan. Their best players on this occasion were James Synnott, Jack Hickey, Kevin Hayes, Zach Jackson and Keith Ryan in a side which hit 10 wides. For Gaelcholaiste Mhuire AG, Daire Ó Conaire at centre-back was the best player on view. Others to do well for the Cork school were Seosamh Ó Maonaigh, Seán Ó Riagáin and Evan Ó Murchú. This entry was posted on Friday, October 14th, 2016 at 4:56 pm and is filed under events, News. You can follow any responses to this entry through the RSS 2.0 feed. Both comments and pings are currently closed.